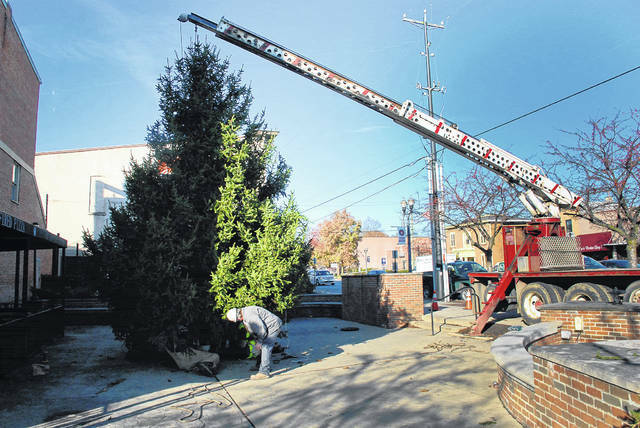 Early Monday morning, crews from the City of Delaware hoisted this year’s Christmas tree into position on the southwest corner of Sandusky and William streets. Under the tree, it might look like presents were placed there, but they weren’t. It’s the crew securing the tree in place before releasing it from the crane’s hoist. The tree-lighting ceremony is scheduled for 6:30 p.m. on Friday, Dec. 1 during Main Street Delaware’s First Friday. For information about downtown Delaware holiday events, visit www.mainstreetdelaware.com.